What ate the benefits of Stem Cell Therapy ? Adult Mesenchymal Stem Cell Therapy Remains Investigational or of Uncertain Benefit Currently. Recently, novel therapy options have become available for the injectable management of knee osteoarthritis, which when combined with existing operative techniques and may offer a potential alternative to joint replacement. However the the techniques remains currently invesitgational. The creation of Hyaline Cartilage remains the “holy grail” of regenerative musculoskeletal medicine. Currently, micro-drilling or autologous chondrocyte implantation of Grade IV osteoarthritic lesions only allows healing with fibro-cartilage. Fibrocartilage has poor loading capabilities & limited survival of 4-5 years. Recent studies have suggested injections of Bone Marrow Derived MSCswith PRP, hyaluronic acid injections, subchondral micro-drilling techniques and limb mal-alignment correction by way of osteotomy improves patients outcomes when compared to those who did not receive them in a randomized controlled trials. The effect is only modest however. Other forms of MSC's, such as Adipose Derived MSCs, unfortunately have shown no benefit when directly injected into the joint. Mesenchymal Stem Cells maybe an emerging cellular management tool in the future for managing osteoarthritis, with the exact mechanism of actions and best source of MSCs remaining unclear. 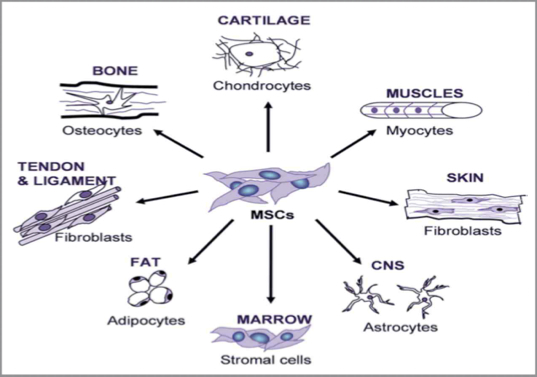 Mesenchymal stem cells (MSC’s) are partially committed mesodermal stems cells, which usually surround small blood vessels, that can differentiate to create bone as osteoblasts, adipose tissue as adipocytes and cartilage as chondrocytes. MSC’s differ from embryonic stem cells, as embryonic stem cells can differentiate into any cell type. MSC’s can only differentiate into mesodermal cells lines, which fortunately produces all musculo-skeletal tissues, making them a powerful potential joint regeneration tool. Mesenchymal stem cells can be derived from a number of sources, including the bone marrow and finally adipose tissue via liposuction. The best source of MSC's remains uncertain at this stage. Bone Marrow Derived Stem cells have been shown to mildly benefit patients undergoing microfracture and osteotomy in studies. Adipose Derived Stem Cell injections have not been shown to benefit patients in recent studies at the Royal North Shore. What is the Cost of MSC injections? At this stage, the harvest and separation of MSC’s is not covered by either Medicare or Private Health Insurance. The expansion of Bone Marrow Derived MSCs remains investigational and not performed in Australia. Iliac Crest Bone Marrow Concentrate injections remain investigational and their benefits remains uncertain. Adipose Derived Stem Cell Injections are not and have never been offered at OSSM due to a lack of evidence suggesting benefit over placebo. The risks appear to be relatively low as the injection consists of the patients own concentrated cells. Infection would be the most severe complication, but is fortunately rare. 3. Re-injection into the joint. Can it be done with other operations? It is performed with arthroscopy subchondral micro-drilling and osteotomy if required. An aligned stable knee is required. MSC therapy currently remains investigatory in use in Australia. The use of MSC’s is currently investigational, however patients with focal Grade IV osteoarthritic lesions, low BMI’s and correctable malalignment appear to be the best candidates in published studies. The primary roles of adult stem cells in a living organism are to maintain and repair the tissue in which they are found. By injecting the MSC’s into the knee, it is hoped the MSC “differentiates” into a chondrocyte, but it depends on the local environment or matrix to form onto, hence micro-drilling is often undertaken simultaneously. Another more likely mechanism of action is the role of the MSC as a paracrine regulator, releasing of local anti-inflammatory mediators such as Interleukin.